Interesting & Unique Men’s Blazers — Anna Akbari, Ph.D. 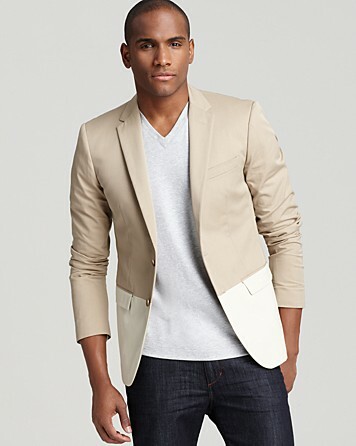 The blazer is an irreplaceable article of clothing in men’s fashion. It’s tied to the same qualities of polish and corporate uniform that we’ve already discussed in reference to the rise of the business suit. It’s also influential in women’s fashion – we’ve recommended blazers as a way to add structure and elements of professionalism to decidedly feminine ensembles. However, men could take some tips from womenswear, as well. We don’t think men should be afraid of color, prints, and unconventional structures as a way to integrate some self-expression into their casual and workwear. Here are some blazers that do just that. ASOS Blazer with Trim Detail Navy is usually a go-to color for many blazers and men’s jackets. However, though blue may have ties to rationality and the corporate world, you can still pull off softer colors while looking sharp. The diluted and dotted lining of this blazer are more fun than feminine. Details like the notched lapel and split vent give this piece a traditional fit that’s easy to throw on casually, but the contrast piping is an eye-catching touch that makes the entire look just that much more dapper. Michael Kors Colorblock Blazer The colorblock has been a strong trend in womenswear for the past few years, adding a graphic contrast to basic shapes without the busy look of a print. It’s used to a subtle effect here, just accenting a beautifully structured jacket. Because both shades of the color block are in off-shade neutrals like camel and cream, it’s intriguing, but not off-putting. The double back-vent relaxes the fit, and the colors make it easy to pair with jeans or pretty much any neutral. This will be a refreshing addition to any closet full of the same old colors, without actually throwing off most color schemes. Topman Grey Heritage Fit Blazer with Leather Look Sleeves Leather jackets are definitely, historically cool, but they can be a big commitment, in terms of putting an outfit together. 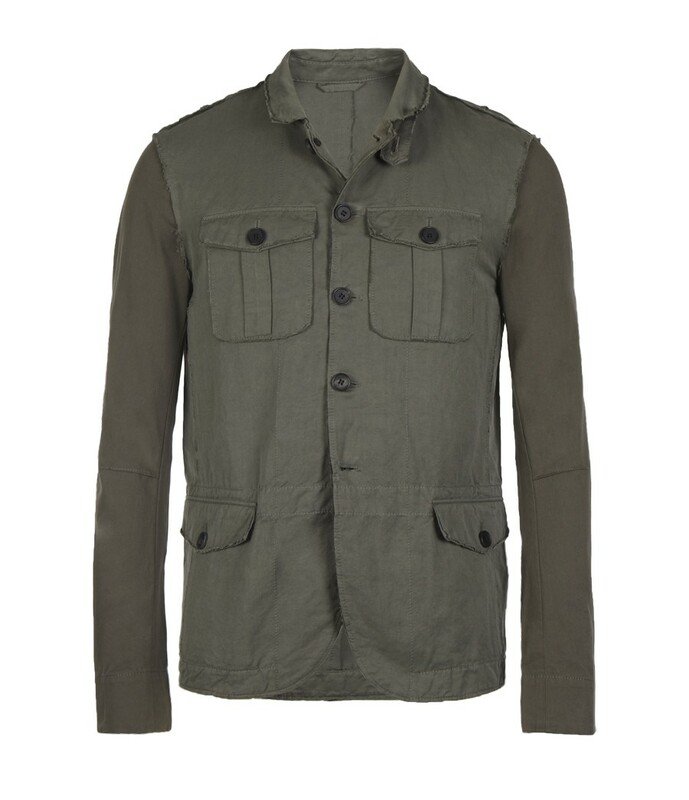 With this Topman jacket, style and substance collide. By keeping the leather look as just a sleeve accent, this blazer adds just a touch of rebellious flavor to an otherwise traditional structure. Prefer actual leather? Check out this similar style by Fremont. 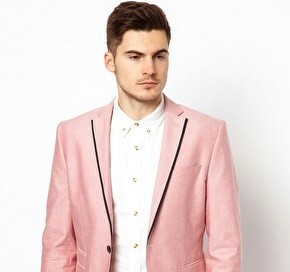 All Saints Okinawa Blazer We think of the blazer as a traditional and refined article of clothing. 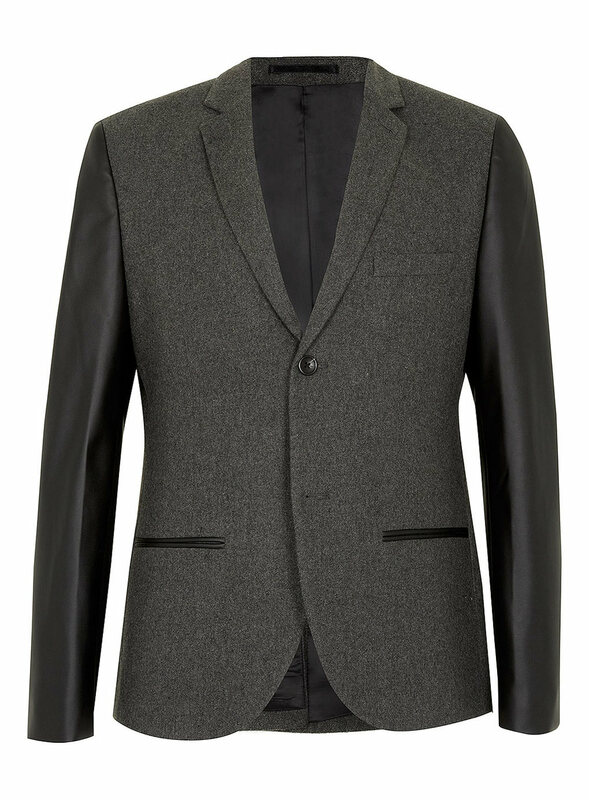 This All Saints blazer completely rethinks that, reshaping it with alternately clean and rough lines and edges. We love the dark green khaki and flap pockets, which evoke the traditional military jacket, while maintaining the slim fit that makes blazers so versatile. However, the elbow patches and working cuffs hearken back to the traditional sportcoat. All put together, it gives off a look of deconstructed, effortless cool. 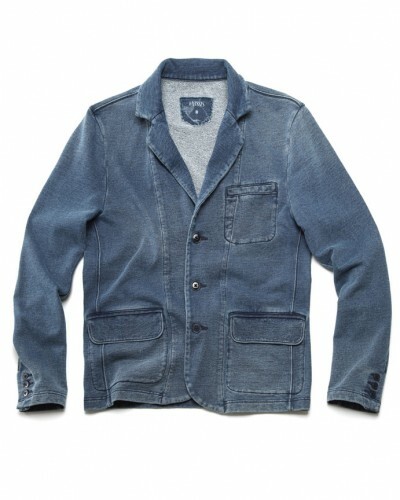 Onassis Clothing French Terry Blazer The indigo yarn that makes up this blazer marries traditional refinement with the down-to-earth street-style cool of the denim jacket. Additionally, the fabric is soft and comfortable. However, (despite its affordable price) this truly is an investment piece in the sense that it will change as you wear it out – intentional discoloration from washing will enhance the vintage look of the garment , making it look like a well-worn favorite. Ask Anna: How have male body ideals evolved? Ask Anna: How have female body ideals evolved over the years?